Civil law and civil process. Family law. International private law. Commercial law. Commercial-procedural law. Criminal law and criminology. The penal law. Criminal procedure and criminalistics. Forensic examination. Operational activities. Judiciary. Prosecutors and advocacy. Krupchan O. D., Director of the Academic Burchak F. G Private Law and Entrepreneurship Scientific Research Institute of National Academy of Law Sciences of Ukraine, Doctor of Legal Sciences, Professor, Academic of the National Academy of Law Sciences of Ukraine. Galantich M. K., Vice-Director for Scientific Work of the Academic Burchak F. G Private Law and Entrepreneurship Scientific Research Institute of National Academy of Law Sciences of Ukraine, Doctor of Legal Sciences, Professor. Halay A. O., Professor of the Department of Civil Law and Procedure of Ternopil National Economic University, Doctor of Legal Sciences, Associate Professor. Kindyuk B. V., Professor of the Department of Theory and History of State and Law of Ternopil National Economic University, Doctor of Legal Sciences, Professor. Stefanchuk R. O., Head of Non-governmental organization “The League of Professors of Law”, Doctor of Legal Sciences, Professor, Corresponding Member of the National Academy of Law Sciences of Ukraine. Voloshin Y. A., Head of the Department of International Law of National Aviation University, Doctor of Legal Sciences, Professor. 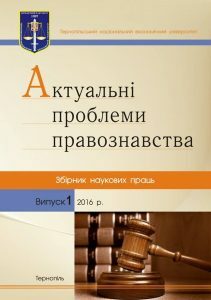 Serdyuk P. P., Research Officer of Scientific and Methodological Support for the Organization of Work and Management in the Prosecutor’s Offices of the National Academy of Public Prosecutor of Ukraine, Doctor of Legal Sciences, Professor. Hrystynchenko N. P. Professor at the Department of Economic Security and Financial Investigations of Ternopil National Economic University, PhD of Legal Sciences, Associate Professor. Banakh S. V. Dean of the Law Faculty of Ternopil National Economic University, PhD of Legal Sciences. Sloma V. M. Vice-Dean of the Law Faculty of Ternopil National Economic University, PhD of Legal Sciences, Associate Professor. Kravchuk M. V. Head of the Department of Theory and History of State and Law of Ternopil National Economic University, PhD of Legal Sciences, Associate Professor. Rogatynska N. Z. Head of the Department of Criminal Law and Procedure of Ternopil National Economic University, PhD of Legal Sciences, Associate Professor. Zhukorska Y. M. Associate Professor at the Department of International Law, International relations and Diplomacy, PhD of Legal Sciences, Associate Professor. Dziega Anzej, Dean of the Faculty of Law, Canon Law and Management of the Lublin Catholic University of John Paul II, Doctor of Legal Sciences, Professor (Poland). Mezharos Peter, Associate Professor at the Department of Civil and Commercial Law of Tarnavsky University, Doctor of Legal Sciences (Slovakia). Perniore Petr, Vice-Dean of the Faculty of Law and Management of the Silesian University in Katowice, Doctor of Legal Sciences, Professor (Poland). Phlogathis Spiridon, Director of the European Public Law Organization (Greece), Doctor of LegalSciences, Professor (Greece). Zol Frederic, Professor at the Department of Civil Law of Jagiellonian University, Head of the Department of European and Polish Private Law and Comparative Law at Osnabruck University, Doctor of Legal Sciences, Professor (Poland).